Rashid Arshed lives in Montclair, California – a quiet suburb of Los Angeles. From a studio in his garage, he paints using mostly oil and acrylic on canvas. He is a perfectionist at heart and follows a well laid out and disciplined approach to his art practice. He prefers to stretch his own canvases, and use thumbtacks to hold the canvas instead of quick and easy application of staples. He painstakingly prepares his canvases with Gesso foundation, priming the surface for painting, making it slightly textured and ready to accept paint as without Gesso the paint would soak into the weave of the canvas. This is an important practice to give long life and endurance to paintings. Arshed says, “I prepare my canvases with archival quality in mind that should last for several generations.” A practice I wish all artists would adopt and adhere to. Arshed is a gentle giant when it comes to teaching or explaining art. He is exceptionally soft spoken. Each word is weighed and measured, and his statements well-articulated and thought-out. His calm and quiet persona is reflected in his art. He says “my paintings cannot be classified as calligraphy, they are not words they are lines and forms”. 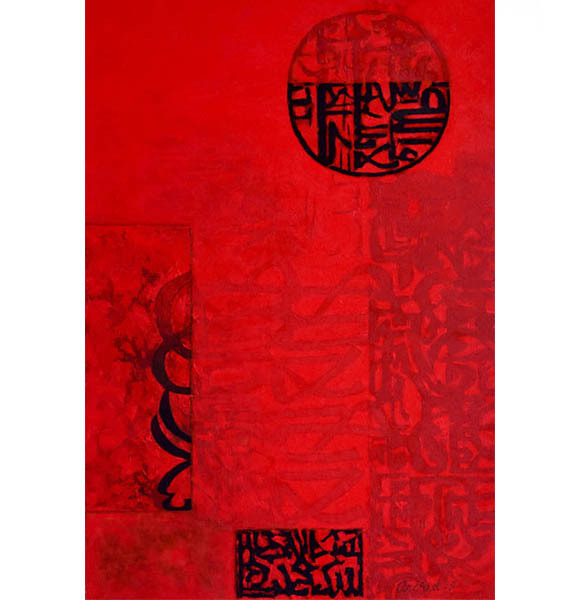 Although well versed in the art and history of Islamic calligraphy – his paintings do not necessarily contain Arabic letters. They are abstract texts. Through analysis and appeal, the form keeps changing dramatically in his works. He talked fondly about calligraphy, and how it reached its zenith during the Ottoman Empire. “Arabic text originated a few centuries before Islam and Kufic, one of earliest script was used to scribe Qur’an. Over the centuries, it flourished in all centers of learning in the Islamic world, mainly, Damascus, Baghdad, Cairo, Isfahan, Kabul, Lahore and Delhi. Maghrabi is one of the most beautiful scripts originated in North Africa and perfected in Spain.”Arshed explains. About his art he says ““I draw my inspiration from old manuscripts, architectural inscriptions, decrees, emblems, coins and seals. I explore pictorial characteristics of calligraphy and transform them into a modern painting, where the emphasis is on form, linear rhythm, color and texture. I ask my audience not to try to read my paintings but enjoy them like any work of art”. In 1971, he held his first exhibition in Karachi titled the Manuscript. 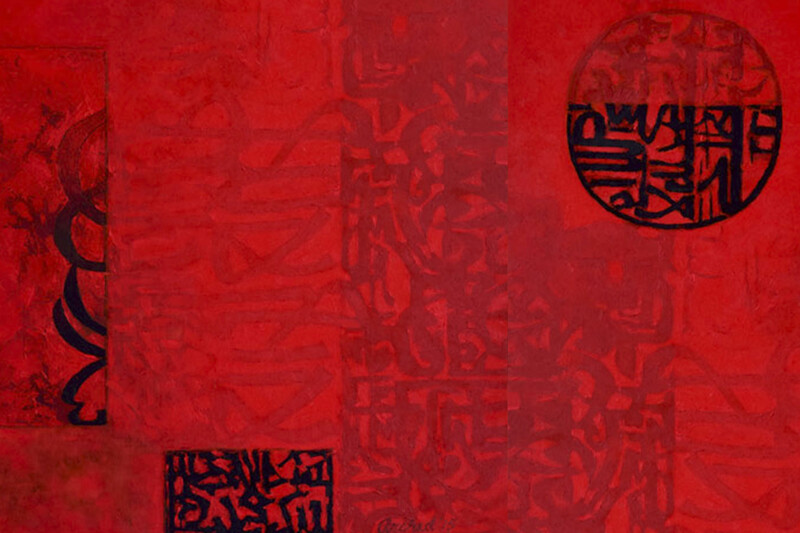 His second exhibition based on calligraphy was held in 1972, following which S. Amjad Ali wrote “Rashid Arshed does not practice calligraphy. He uses the beautiful effects produced by masterpieces of calligraphy as the subject of his paintings. In his paintings we are reminded of old Farmans of Kings, inscriptions, on historical monuments, beautiful old manuscripts, and other master pieces of the art of writing. He uses the look, the feeling, the atmosphere, of the writing as the subject of the painting. 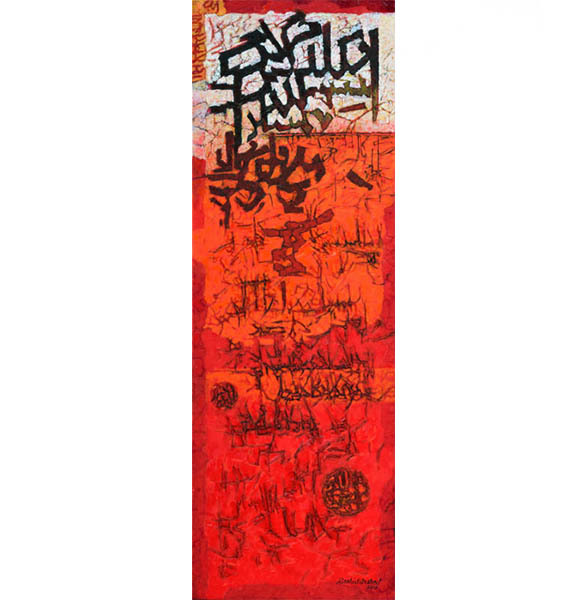 It is a creative and not a passive use of calligraphy, because he is not repeating any style or even his style of writing, but introducing new elements to the bare and austere linier rhythms of writing, so as to make it painting. I find Arshed’s art meditative. His abstract paintings with minimal forms induce altered states and present timeless aesthetics. His ‘calligraphy’ is analytical as he dissects the traditional master pieces to explore the aesthetics. A lot of things happen in the process. This should also explain the use of Blacks and Whites and Reds which, along with the boldness of design, proclaim a sense of spiritualism. This is evident in his most recent work from ‘Beyond Word’ series exhibited in USA in 2015. Although calligraphy comes naturally to Arshed as his mother placed a Takhti (writing tablet) in his hand when he was 3 years old, he has come up with his own innovative style for his paintings. Growing up he saw his father’s collection of newspapers become yellow – which he likes to reflect in his work as patina to give an antique look to his work. He says “The subject of Calligraphy to me is an expression of peace, serenity and spiritualism. 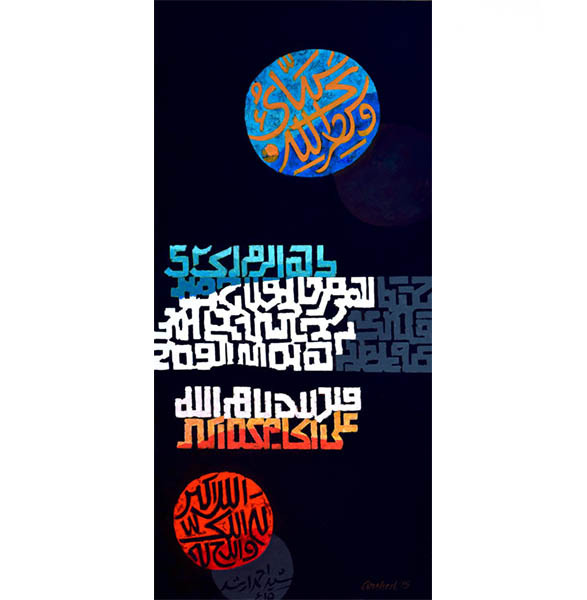 The inherent mystic quality of the Arabic characters, together with chromatic, tactile and spatial dispensations, imbibes a spiritual aura into calligraphic painting and the act of painting is turned into meditation or Zikr”. 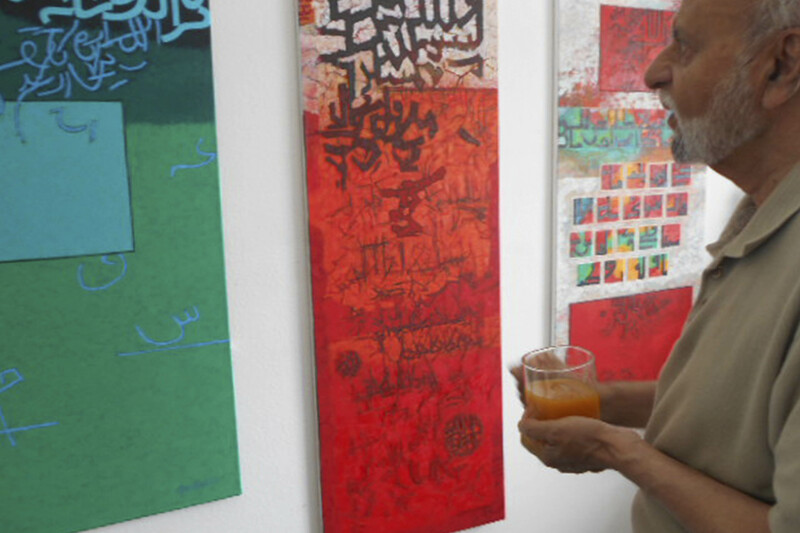 Arshed believes that Chinese calligraphy is stronger and richer than Arabic calligraphy. He says “There is freedom there. Chinese calligraphy is simple yet powerful. Each stroke is a work of art”. Arshed prefers modern and contemporary over traditional and would rather visit a museum of contemporary art than traditional if he had time to see only one. He greatly admires the New York School of Abstract and Pop Art that dramatically changed the art scene. He particularly mentions Jasper Johns the most influential painter of the group. Amongst the Pakistani masters, Arshed has very high regards for Shakir Ali, Sadequain, Jamil Naqsh, Ahmed Parvez, Zahoorul Akhalaq, Imran Mir and for new generation of young miniature painters who have explosively ventured into new horizons of creativity. Arshed joined Mayo School of Art in 1956 and found the academic system on the decline and the atmosphere uninspiring. However, things improved after Mark Sponenburgh took over as principal, and Arshed stayed on to graduate from the National College of Art (as it rebranded itself) in 1960. During this period, Rashid Arshed interacted with senior artists like Abdur Rahman Chughtai, Zubaida Agha and Shakir Ali. His contemporaries were Jamil Naqsh, Zahoorul Akhalq, Bashir Mirza and Ahmed Khan who all went on to become great artists in their own right. He taught at Central Institute of Art in Karachi from 1968 to 1975, and after Ali Imam left in 1970 to open the Indus Art Gallery, he was appointed Principal, a position he served until 1975 when he left for the USA. He recalls among his notable students the late Imran Mir, Noorjehan Bilgrami, Rumana Hussain, Niilofur Farrukh, Shakeel Siddiqui and Samina Mansuri. Arshed returned to Pakistan in 2006 to take up the position of Head of Fine Arts Department at Indus Valley School of Art and Architecture. He was there until 2008 and left due to the worsening law and order situation in Karachi, which unfortunately prevails even today to a great extent. His solo exhibition will be held in Los Angeles in August 2016. Ali Adil Khan is an art writer, curator and collector based in Toronto. He is the founder of South Asian Gallery of Art (SAGA) and Visual and Interactive Arts of South Asia (VIRSA). He actively promotes South Asian art, music and culture in Canada.